Temperatures of minus 3 and a vicious northerly wind saw us make a last minute venue change from The Training Centre Marquee to the main room in the Clubhouse, why? Well; Heel Work to Music and Crufts Champion, Richard Curtis came to Mullenscote to deliver a workshop that was nothing short of genius. Watching Richard put his dogs through their paces left us spell bound. 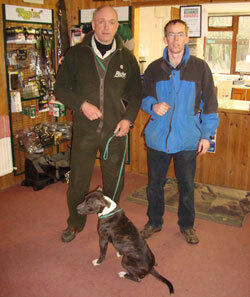 The workshop gave Mullenscote Trainers and clients an opportunity to work their dogs under Richard's expert guidance. Clicker training is something we use as a training technique for basic behaviors here at Mullenscote, but watching how Richard uses the Clicker to train the advance behaviors that he and his dogs demonstrate in their Arena Shows is a real privilege. Bringing industry experts like this to Mullenscote is something we do on a regular basis, ...it helps with our own Professional Development and gives our Clients a rare chance to watch, meet and discuss technique with some of the Dog Training Industry's leading Super-Stars, "We're hoping to get Richard back later this year," says Mullenscote Trainer Howard Kirby.